Anthony Atkinson’s proposal for a participation income (PI) has been acclaimed as a workable compromise between the aspirations of unconditional basic income proposals and the political acceptability of the workfare model. This article argues that PI functions poorly in terms of a number of essential administrative tasks that any welfare scheme must perform. 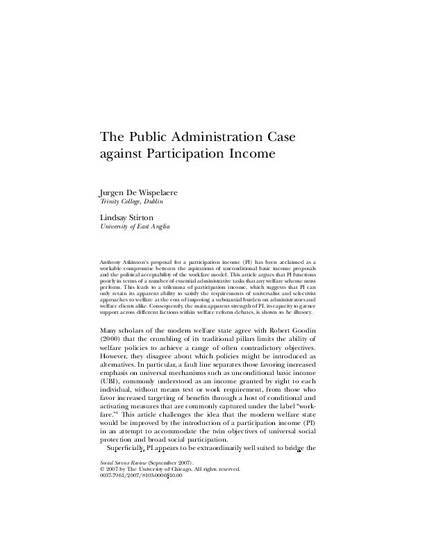 This leads to a trilemma of participation income, which suggests that PI can only retain its apparent ability to satisfy the requirements of universalist and client-activation approaches to welfare at the cost of imposing a substantial burden on administrators and welfare clients alike. Consequently, the main apparent strength of PI, its capacity to garner support across different factions within welfare reform debates, is shown to be illusory.